After a sell out debut year somersault announces 2015 return, headliners confirmed as Bombay Bicycle Club and Laura Marling plus one more to be announced soon. Somersault promises a long weekend of music & adventures, with a line up of outward bounds, gastronomic delights, circus, games & encampments, wellbeing, comedy, theatre & after hours parties. Somersault is anything but another music festival. Packed full of music, adventures and the best of outdoor living, Somersault is back for 2015 after its 2014 debut saw a previously unimagined festival experience come to life. With seaside escapades, field trips, craft and culture classes on offer by day before fun-fuelled feasts and forest festivities under the stars at night, Somersault promises 5 days of stripped back happiness for all. Testament to its universal appeal, Somersault’s debut in 2014 completely sold out, welcoming 15,000 revellers from 17 different countries as far away as Australia and the US. Somersault’s coastal setting prides itself on affording campers a wide range of activities. For the adventurous, there are surf trips to nearby Croyde Bay, in addition to coastal rafting, paddle boarding and coasteering. Back on dry land, activities include trekking, horse riding, mountain biking on the nearby Exmoor, plus falconry, archery, yoga, and much more. On the music front, Somersault is proud to offer an exciting line up for 2015 across their stages. Headliners confirmed include Bombay Bicycle Club, who released their fourth studio album, ‘So Long, See You Tomorrow’ in 2014 to great critical and public acclaim. The album reached number one in the UK album charts and received a Mercury nomination. 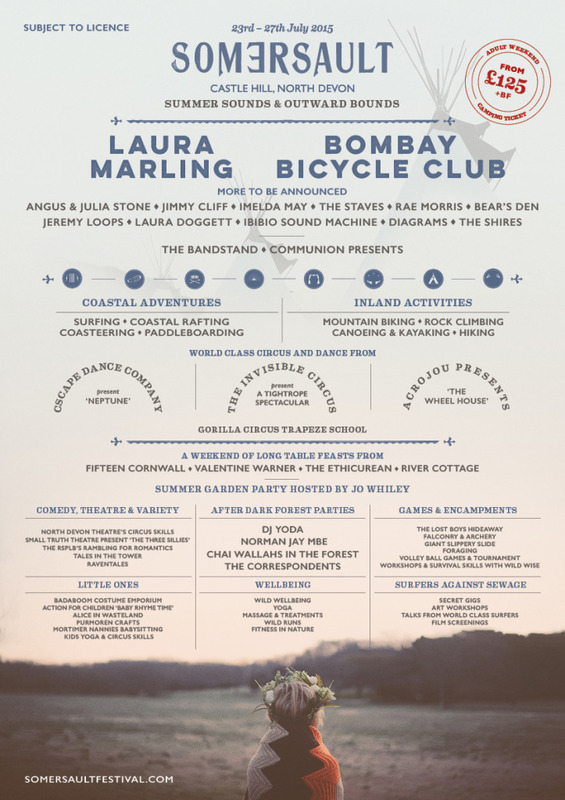 Headlining alongside Bombay Bicycle Club at Castle Hill Estate will be acoustic favourite – Laura Marling. Laura has recently returned to the music scene with her fifth album ‘Short Movie’ after a brief hiatus. She was crowned best British Female at the BRITs in 2011. The third headliner will be announced in the coming weeks. Joining the headliners at Somersault will be Angus & Julia Stone, Jimmy Cliff, Imelda May, The Staves, Rae Morris, Bear’s Den, Jeremy Loops, Laura Doggett, Ibibio Sound Machine, Diagrams, The Shires and plenty more to be announced across three stages. When the live music draws to a close the night remains young for those wishing to venture into the forest, as the party continues with DJ Yoda, Chai Wallahs, The Correspondents and Norman Jay MBE taking to the decks until the early hours. Somersault hosts a variety of music and theatre, including a stage hosted by Communion Music. The River Bray, which runs through the site offers festival goers the chance to cool off after trying their hand at the various activities on offer and for those looking to take things down a notch, The Wellbeing area hosts yoga classes, massages, meditation programmes and much more. A plethora of circus & theatrical acts will be coming to Somersault 2015, including immersive experiences and spectacular open-air theatre and story telling. Renowned TV and radio presenter Jo Whiley will be hosting a vintage themed garden party at the beautiful West Wing of Castle Hill. Set in the magical gardens overlooking the estate, guests will enjoy Peach Bellinis and a classic English tea while listening to acoustic music from main stage performers. During tea Jo will interview a surprise festival artist before the guests are treated to a bespoke Somersault fashion show curated by designer Minna. Far from the festival burger vans of old, food fanatics can get their fill of gastronomic delights by discovering Somersault’s Long Table Feasts. Jamie Oliver’s Fifteen Cornwall, Valentine Warner, River Cottage and The Ethicurean will all be on site serving 3 course gourmet meals to the hungry festival goers. The beautiful festival site at Castle Hill in the midst of lush Filleigh, North Devon boasts spacious, ample camping grounds alongside a luxurious boutique campsite. Yurts, tipis, bell tents and even gypsy wagons are on offer at the boutique campsite for those wanting to make the Somersault experience even more memorable. Somersault Festival’s nominated charity is Surfers Against Sewage. Surfers Against Sewage (SAS) is an environmental charity protecting the UK’s oceans, waves and beaches for all to enjoy safely and sustainably. The charity’s work is carried out year round via community action, campaigning, volunteering, conservation, education and scientific research. SAS offered a fantastic presence on site last year, coordinating off site surf expeditions and curating an onsite programme of activity; featuring an art installation made of refuse and a range of acoustic sessions in their tent.